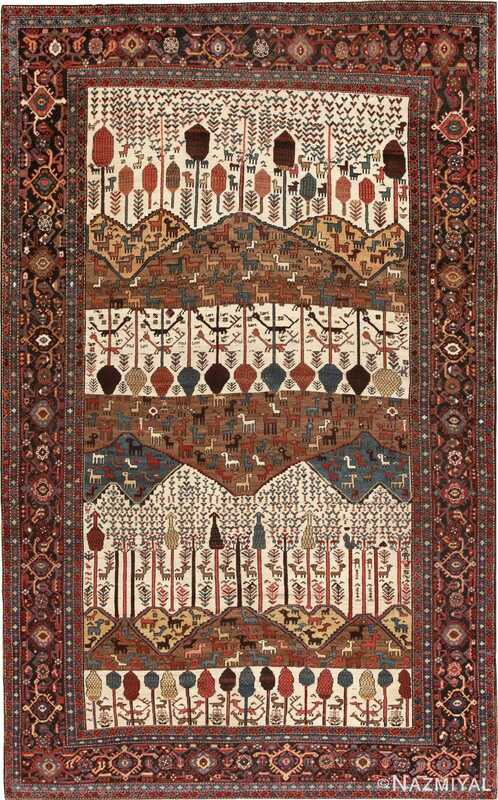 Exhibiting a wonderfully original landscape pattern, this antique Bakshaish rug represents the best of village designs from northwest Persia and the Heriz region. Tribal Design Antique Persian Bakshaish Rug, Country of Origin: Persia, Circa Date: Late 19th Century – This stupendous antique Persian carpet from the village of Bakshaish is an exceptional representation of the creativity and originality that make local rugs sought-after collector’s items and design pieces. This fascinating antique Bakshaish rug displays an incredible striated landscape scene with rolling hills, plains and open areas filled with herd animals. Expert variations in the color of the flocks and their body positions give the whimsical design a stylistic richness. After investigating the nuanced scenes, people, herdsman and intricately detailed protection symbols emerge between the charming animals. Towering trees, branching Tree of Life motifs and articulate shrubs provide a secondary theme that completes the pastoral scene naturally. 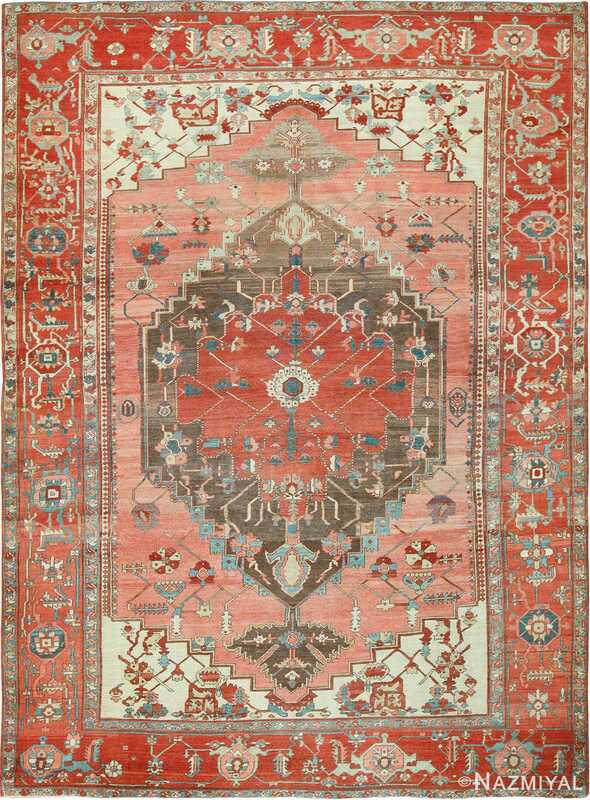 The regional Heriz rug influence is revealed fully in the stunning turtle-and-vine scroll borders, which are augmented by a repertoire of carefully outlined symbols true to Bakshaish traditions. 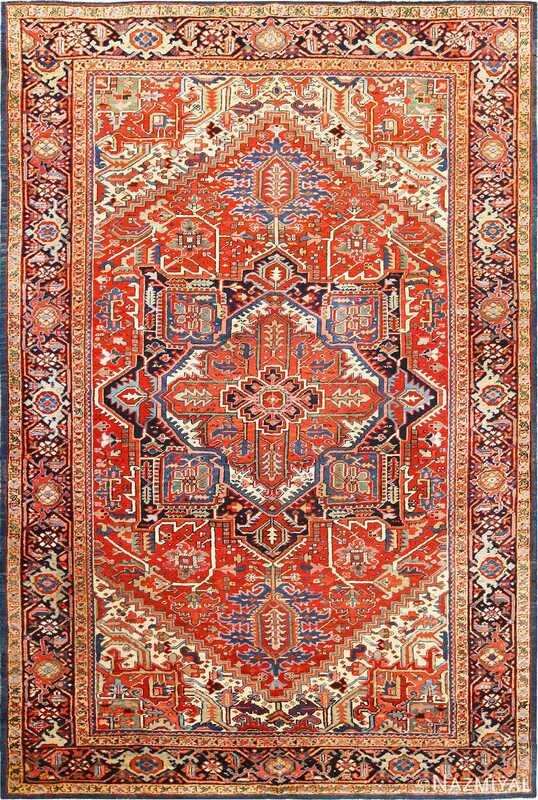 Created in northwest Persia, this exceptional antique Bakshaish rug features an intricate allover latticework pattern decorated with auspicious eight-pointed stars.